The SPS-202 station provides manual fire reporting. These high quality, die-cast metal manual stations are a dual action configuration with SPST contacts and terminal strip connections. The normally open contact, which closes when the manual station is activated, is rated for 1 amp, 30 VDC. The contacts are gold plated to avoid the risk of corrosion. 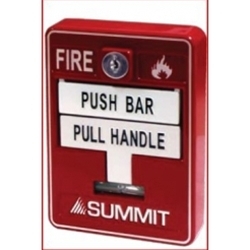 The SPS-202 dual action manual station is operated by pushing the bar labelled "PUSH BAR" and then pulling down the handle marked "PULL HANDLE". The station is reset by opening the station with the key, placing he handle in the normal upright position and re-locking the station.